The size of the stamp will be determined automatically, provided that the box Determine size automatically has been checked. The stamp size will be determined by using the size in pixels and the resolution of the scan (DPI). In some cases however, a picture contains an incorrect value for the resolution resulting also in an incorrect size of the stamp. This is mostly the case when the picture has been edited by an external software package. By unchecking the box Determine size automatically you can set the size of the stamp manually. The size of the frame will be deduced from the size of the stamp. Therefore, white space will be added to all sides of the stamp. The standard amount of white space that will be added can be set by the setting "Distance from frame to perforation" on the tab page "Misc" on the screen "Settings". The file name will be set if the picture has been read from or has been saved to your file system. You can save the picture with the button Save. With this button you can save the picture to your file system. Indicates the number of pixels per inch (DPI) of the picture. Using this value the real size of the stamp is determined. A picture of 600 pixels wide and a resolution of 300 DPI has a real width of 2 inches (approx. 5.1 cm). The resolution is a value which is normally saved inside the picture file. However, in some cases this value is incorrect resulting in an incorrect size of the stamp also. By unchecking the box Determine size automatically you can set the size of the stamp manually. Indicates the size of the picture in pixels. Using this value and the resolution the real size of the stamp will be determined. You can drag pictures from the toolbar "Pictures" onto your album page. If the object type has been set to "Stamp" the picture will be changed into a stamp automatically, including a frame. However, if the object type has been set to "Picture" the picture will not be changed into a stamp. The picture will be treated as a picture inside your album. This offers you the possibility to easily assign pictures to existing stamps in your album. With the function "Crop" you can indicate how the stamp must be cut out from the original scan. Normally, the function "Scan and analyse" does this job automatically but in some cases the result might not be optimal. The blue lines indicate where the picture will be cropped. You can crop the picture in two ways. The first and easiest way is to drag the blue lines with your mouse. Therefore move the mouse to the blue line. The mouse pointer now changes into a double vertical arrow: . Click on the left mouse button and drag the line until the picture has been cropped correctly. Now release the mouse button. The size of the stamp will be adjusted automatically. 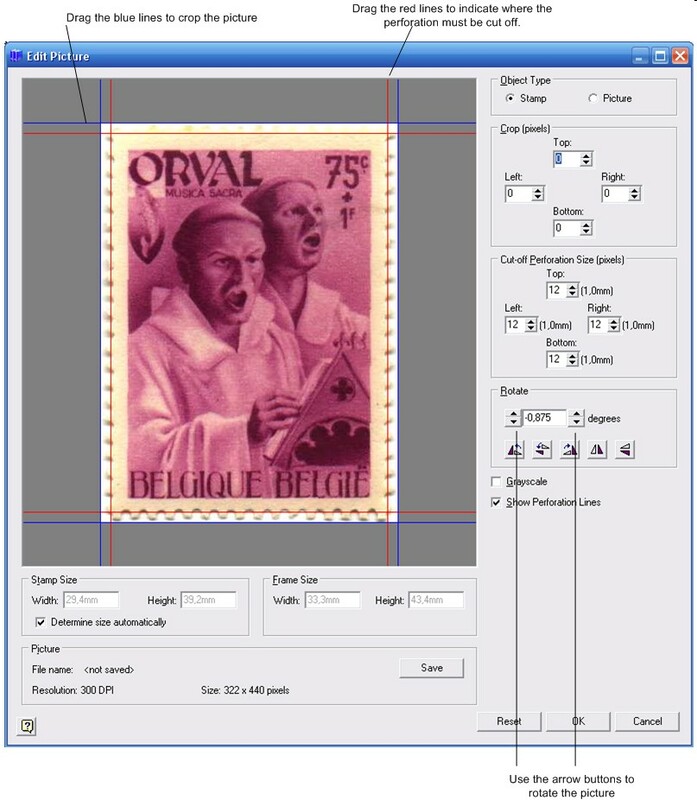 The second method to crop stamps uses the edit fields Crop at the right side of the screen. If you are planning to use the picture in your album, normally you do not like to show the perforation. With the function "Cut-off Perforation Size" you can indicate where the perforation must be cut off. The red lines indicate where the perforation will be cut off. You can cut off the perforation in two ways.The first and easiest way is to drag the red lines with your mouse. Therefore move the mouse to the red line. The mouse pointer now changes into a double vertical arrow: . Click on the left mouse button and drag the line until the perforation will be cut off correctly. Now release the mouse button. The second method to crop stamps uses the edit fields Cut-off Perforation Size at the right side of the screen. By default, Stamp Album Studio will cut off a band of 1 mm. for the perforation of the stamp. This standard size can be adjusted by the setting "Size to cut-off for perforation" on the tab page "Misc" on the screen "Settings". With the function "Rotate" you can rotate the stamp around its center. Normally, the function "Scan and analyse" does this job automatically but in some cases the result might not be optimal.With the arrow buttons you can rotate the picture. The left buttons rotate the picture clock wise or counter clock wise by 1 degree. The right buttons rotate the picture clock wise or counter clock wise by 0.125 degree. You can also enter a value manually. Finally you can rotate the picture by 90, 180 or 270 degrees with the three buttons on the left below the edit field. The two buttons on the right flip the image horizontally and vertically. If you are planning to use the picture in your album, normally you like to show the picture in gray colors. This can easily be done by checking the box Grayscale. With the setting "Grayscale after analysis" on the tab page "Misc" on the screen "Settings" your can indicate that all pictures that are analysed will be changed into grayscaled pictures. With this option you can indicate if the red lines must be shown. Hiding these lines can give a clearer view of the picture. With the button Reset all modifications will be undone. The screen will not be closed. With the button OK the modifications will be saved and the screen will be closed. The picture on the toolbar "Pictures" will be adjusted. With the button Cancel all modifications will be undone and the screen will be closed.